In a convention about wars past, present and future, sports games and fantasy worlds set far, far away from our own, one game stood out to me with its strong grounding in reality and even stronger message of anti-bullying. It’s called Concrete Genie and while it didn’t get a trailer during Sony’s keynote, it’s something I couldn’t get enough of at the show. So how exactly did a game about a teenager with an oversized paint brush enthrall me? While soldiers are important to keeping the world safe and secure, and sporting events keep me entertained after long days and nights at the office, they’re not the best representation of my life. I’ve never fought on a battlefield, and sports, well, those aren’t my forte. But being a creative kid - the kind who liked to write, create and play and one who got picked on after and during school - Concrete Genie really speaks to me. For people like me, Concrete Genie is that little window into the past - one that jogs your memory for what it was like to be fun and creative in a world that seemed scary and glum. The enemies aren’t aliens that crashed on earth but real bullies that try to steal your creativity, figuratively and literally, by taking away your creative tools. It’s a game that’s deeper than it lets on, and one that might just offer the best message on a showfloor bursting with explosions, gunshots and the sounds of clashing swords. Armed with an aspirational drive to make this world a little brighter, Concrete Genie puts you in the shoes of Ash, a teenage boy living in a depressed town called Denska. Denska used to be a wonderful, industrious city (much like my hometown of Buffalo, New York) but an environmental catastrophe shut down the fishing industry and put a funk over the town. Now, darkness literally clings to the buildings and strings of lights sit dormant along the walls of alleys. But Ash wants to fix this - he loves his town and he wants to help restore it to the way it was. The way he’ll do it is through his magic paintbrush that can create murals on the sides of the buildings, illuminating lights around town and driving out the darkness. To draw murals, you’ll press the touchpad and select from a series of template sketches (in our demo, nature scenes like grassy fields, dandelion patches and pine tree forests), and then use the DualShock 4 sixaxis controller to paint the side of the building. To help him are the eponymous genies, creatures from Ash’s sketchbook that help him cleanse the darkness. The genies, the developers say, represent the friends Ash wishes he had in real life. They’re supportive, helpful and joyful - just like he is. Like the murals themselves, you’ll draw each of the genies yourself using the touchpad and DualShock 4 controller. You’ll get sketches of new genies as you progress throughout the game after re-collecting pages from the sketchbook (more on this in a second) but each genie can be made to look different - depending on how they’re drawn. Drawing them horizontally makes them a quadruped, while drawing them vertically makes them a biped. You can add horns, tales and flowery outcrops to their bodies and, after they’re drawn, you can bring them to life by approaching them and pressing Triangle. While the genies can help Ash by removing obstacles for him, they can’t help Ash with his real world problems: bullies. The bullies play a key role in the story right from the outset: When they first find Ash, they take his sketchbook, tear out the pages and scatter them. Without pages, Ash can’t draw the murals, and so you’ll need to re-collect them on your journey to set the town right. Similarly, when Ash runs into the bullies, they’ll encircle him and try to take away his brush. If they pry it away, they’ll throw it high up on the rooftops before pushing Ash to the ground. Genies, while all-powerful in Ash’s imagination, desaturate when the bullies are near and merely look on as Ash is mocked and abused. It’s a gut-wrenching mechanic, to be sure, but one that speaks volumes about what it feels like to be bullied. Importantly, there are no controls for Ash to fight back. There’s no button combo for Ash to attack the bullies with the paint brush, for example, and thus Ash’s only defense is to run and hide. While bullies own the streets, they never go up on the rooftops which act as a sort of safe haven for Ash. The developers are paying extra close attention to how the bullies look and act. They pick on Ash, they tell me, because they don’t have the same imagination he does. While Ash wants the world to be bright, vibrant and colorful, the bullies are happy to keep things dark, depressing and intimidating. This comes through in the game’s handcrafted visuals that sit somewhere between traditional CG and almost stop-motion animation. They look gorgeous on a PS4 Pro - even though the game’s still firmly in development. During our demo we noticed some dropped frames which detract from the aesthetic Pixelopus, the game’s developer, is trying to build. But those will hopefully be ironed out by the time the game comes out - hopefully, according to developers, later this year. When it comes out, my hope is that this indie charmer will be openly accepted by the gaming community - as who better can relate to the themes of bullies than those of us who grew up liking games before their comeuppance in the early Aughts? 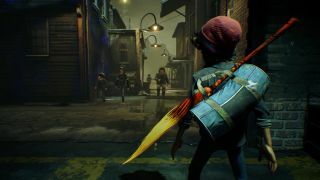 Until then, the game’s trailers serve as bitter reminders of the effects of bullying - the tears that are shed when we’re alone and the sheer malice of schoolyard bullies. These themes are overflowing from Concrete Genie, a title that just captures the zeitgeist around bullying in a way few other games have.